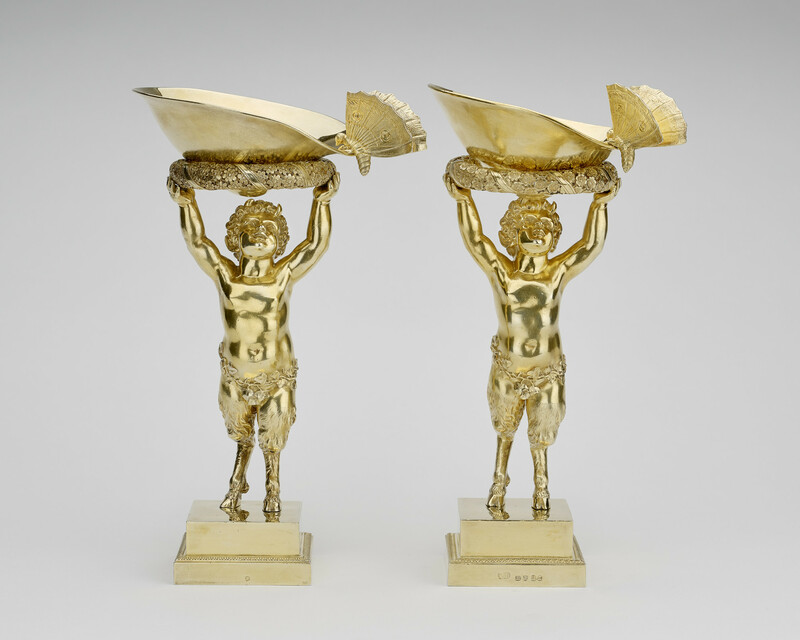 A pair of silver-gilt standing dishes, the shallow bowl modelled in the form of a woman's breast, with handles cast as butterflies. The bowl rests on a wreath of myositis (forget-me-nots), held in the upstretched hands of a faun, standing on a stepped square base. The Prince Regent purchased one of these bowls and a stand from Odiot on 30 November 1815, at a cost of 549 francs. The second bowl is not mentioned in the bill, but seems to have been supplied by Odiot at thesame time. The following year, the second bowl had a butterfly handle added, and a second stand was supplied by Paul Storr on behalf of Rundell's, and both sets of bowls and stands were gilded. Rundell's charged a total of £52 3s 2d for these additions and alterations. Odiot's bill for the bowl described it as being in the form of the breast of Venus (formant Sein de Venus), although E.A. Jones suggested that a more likely model might be Napoleon's sister, Pauline Borghese (1780–1825), who was affectionately known as 'the butterfly'. Other works by Odiot made for the princess show similar butterflies. The design of the faun with its wreath of forget-me-nots was used by Odiot in other works, such as the stand of a veilleuse, showing a similar figure and wreath,but on a taller, cylindrical pedestal, illustrated by Henri Bouilhet (1830–1910) in his comprehensive history of Parisian silver. 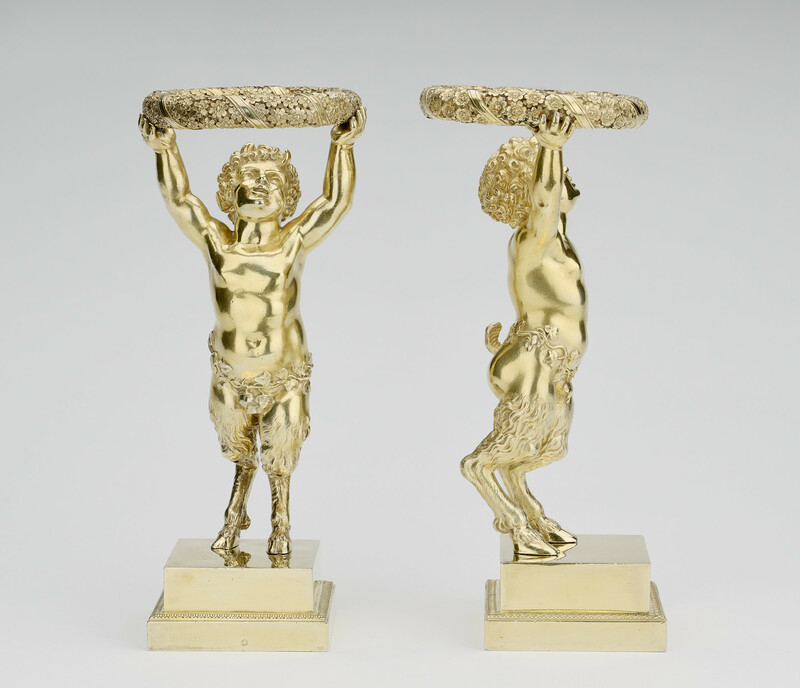 At the Exposition publique des produits de l'industrie française in Paris in 1819, the firm of Odiot displayed a figure of un satyre supportant une couronne (Rapport du jury 1819, p. 92).A similar figure, supporting an egg cup rather than a wreath, was also produced by Odiot. However, other versions of the breast-shaped bowl with butterfly handle are known, and one at least is supported on a faun figure, although with a more elaborate socle. Audrey Gay-Mazuel has demonstrated the popularity of the model over the next decade (Gay-Mazuel 2017, p. 138). The bowls do not have any immediately apparent function, although they have been described as small oil lamps, or as vessels for drinking punch. Bowl of 51069.1 struck with fineness mark (.950), guarantee mark (Paris, 1809-19), and maker's mark of J.-B.-C Odiot; stand of 51069.1 struck with guarantee mark and maker's mark of J.-B.-C Odiot; bowl of 51069.2 struck with fineness mark (.950), guarantee mark, and maker's mark of J.-B.-C Odiot; stand of 51069.2 struck with city mark of London (1816-17), duty mark, and maker's mark of Paul Storr, and stamped, 824. Jean-Baptiste Claude Odiot came from a family of gold and silversmiths. He received many prestigious commissions from Napoleon and and his family including the King of Rome's cradle given as a gift by the city of Paris to Napoleon and Empress Marie-Louise, on the birth of their son Napoleon II. One stand and both bowls were bought from Odiot by George IV, when Prince Regent, on 30 November 1815 for 549 francs. The bill from Odiot describes the bowls as being in the form of the breast of Venus, although it is more likely that they were modelled on the breast of Napoleon's sister, Pauline de Borghese. The second stand was supplied by Rundells in 1816. For a total price of £52 3s 2d, Rundells also added a butterfly handle to the second bowl and gilded all the items.